BJP leader Lal Krishna Advani, yesterday,asked partymen not to be apologetic for the Ayodhya movement and instead take pride in it.It is a well known fact that BJP got a great political exposure only after the unfortunate Babri Masjid demolition and they got to power and formed a government at the Centre because of the issue and even lost it when they did not fulfill their commitment of constructing a Ram Temple on the disputed land of Ayodhya after coming to power. Riots allover India and neighbouring countries broke out taking hundreds and thousands of lives of hindus and muslims, thereafter.Followed was a series of bomb blasts in 1993 in Mumbai in retaliation to the Mosque demolition. Yet Advani ji takes pride on the movement !! Great !! 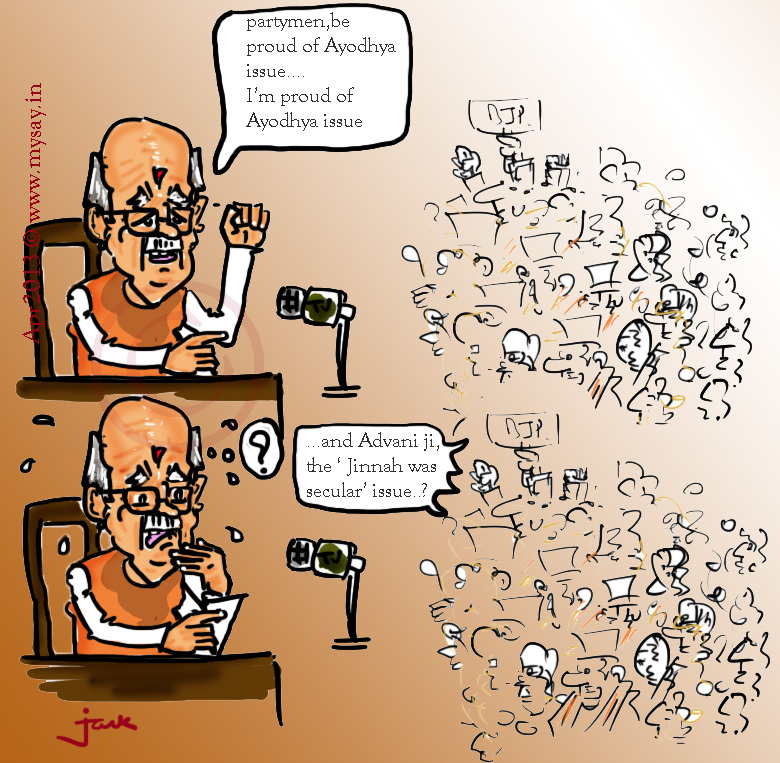 Advani ji’s patriotism is like epileptic fits – comes and goes. hahaha !! epileptic fit of ‘patriotism’ towards Hindutva .. i suppose and that too for vested interests …Atal Ji was lot more resolved and even though he is the pillar of BJP yet he never supported ‘Hindu’ politics !! His was ” country ” only !! 🙂 Love this one. Perfect capture of the double- sided face many of our politicians suffer from.